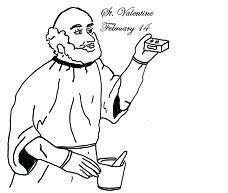 Here are some more ideas for celebrating St. Valentine's Feast day. Make this adorable matchbox craft with Paper Dali! See more Saint Valentine crafts, or see the all of my Valentine's day ideas. Lacy, you post some of the nicest ideas. When our children were little, we did LOTS of crafts. I hope moms of little ones find your posts inspiring. These are wonderful! I'm going to try a few for myself and for fun. And those other ideas are suhWEET. I'll be trying them out with the littles later this week. Thanks for the sharing! These are so cute. My kids are way too old to bring Valentines to school, but I love your fun blog. Not many people willing to share their Catholic faith this way. thanks. Love the Dali paper craft. Thanks! 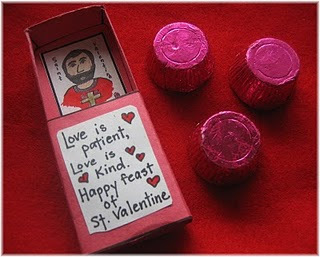 I hope you don't mind, but I included your little matchbox craft in my post about giving priests St. Valentine greetings, along with a link. Really nice idea to share, Lacy. Thanks. this. I'll forward this article to him. Pretty sure he will have a great read. Thank you for sharing!